In these post, I always claim I will post more often, then a few months go by. I was reading the autobiography of Eric Clapton and was wondering, “How the heck does he remember so many things from that long ago?” Not to mention the drug and alcohol induced haze he must have been in the whole time. Then I got to the part where he directly quotes his diary. He also talked about other people who all kept diaries. I remember the idea of keeping a diary was more popular when I was a kid in the 80s, but I don’t really see that anymore. The weblog is probably the modern diary, but they seem to be less personal. Probably because everyone can read it. Any way, I have it on my long-term goals to be less self-conscious, so perhaps I’ll try to make this into more of a diary. I’ll need information for my auto-biography in a couple decades! – I finally got out to Peter Luger’s. I wasn’t that happy with everything. I thought I had too high expectations, and they just didn’t live up to it. The more I thought about it, the more I realized it was our fault. The waiter was being very clear about how they cooked it, and I kind of ignored him and ordered the undercooked porterhouse. It was a little blue, which is their “medium-rare”. From now on, I am going to specify “just past the point where the blue disappears”. I won’t use “medium-rare” anymore. Also, the next few days, I did find myself remembering the tenderness of the steak, and actually dreamt about it once. I now think that they quality of the meat was extraordinary, but I let the miscommunication cloud my opinion. I’d like to go back, but may be difficult to convince my friends. There are so many other steak places in NYC to get to. – My G&G shoes were mentioned in the last post, and now I’ve had some time with them. They are my absolute favorite shoes ever! I was planning on getting a pair from 3 different companies for variety, but now I’m considering just sticking with G&G. 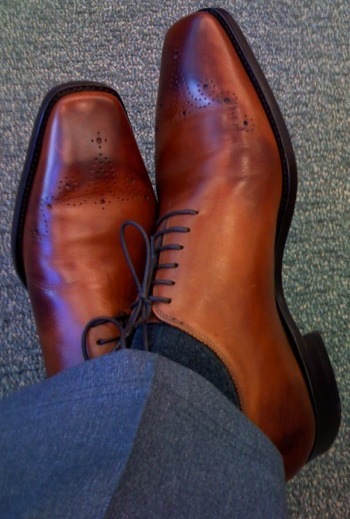 These are my light brown shoes. I still need a dark brown derby and a black brouge’d cap-toe. The other companies I’m looking at are John Lobb Paris and Edward Green. I’ve done a lot of reading on shoes. Also on clothes in general, but I want to keep my clothing purchases to a minimum until I reach a decent weight. Shoes are one of the only things I can really buy at this point. Other than that, my focus has really been on work and trying to exercise. I have been going everyday now and am starting to see some results. I’m on a good path. On the negative side, I haven’t been going out at all. Just work and exercise. Otherwise, I’m watching TV in my room. That’ll change soon.